Adam and Eve expelled from Paradise, 1960. By Marc Chagall. We’ve all done it. Someone does something that offends us and they come to apologize. And, we say something like, “Oh, never mind. It’s ok.” We’re trying to make the other person feel better by saying that what he or she did didn’t really matter. But of course, that’s not really the case. It did matter. At least, it did to us. And, when we take that tack, we’ve missed something important. One of the great lessons from the biblical narrative is that our decisions as human beings matter a great deal. Forgiveness of our sins is precisely the opposite of saying that what we did was “really ok.” There are real and lasting consequences to our moral decisions, which cannot be easily dismissed or wished away. Moral choice implies that there are consequences. Today’s Genesis text reminds us that God gives human beings the dignity of moral choice. And, to use the language of modern economics, God isn’t into allowing “moral hazard.” Moral hazard means that people or institutions are allowed to escape the consequence of their decisions by having someone else assume responsibility for them. While that may sound vaguely similar to what Christians believe about forgiveness as ultimately demonstrated in Christ’s death for human sin, it is actually quite different. We’ll explore the differences in another devotional, but for now I want to focus on what we can learn from God’s gift of giving us moral choice without moral hazard as demonstrated in the Genesis 3 story. First, our text reminds us that God takes our decision making with utter seriousness. He doesn’t abrogate the consequences of our actions. In fact, what we might think of as personal and private decisions have surprisingly far-reaching public effects. 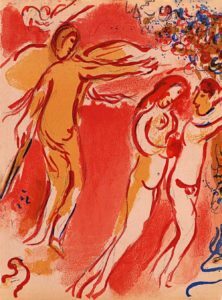 Adam and Eve’s disobedience results not only in a disruption in their relationship with God, but that disruption carries over into their relationship with each other and into the work they’ve been given to do. It is an important reminder that our human work and relationships are integrally related to our relationship with God. Marring one mars the others. Second, our text reminds us that despite the utter seriousness of our sin and its consequences, God’s vocation for us does not change. It is interesting to note that even as Adam and Eve are banished from Eden, the text states that they are “sent forth … to till the ground,” a phrase that repeats the original mandate that humanity was given when placed in the garden (Genesis 2:15). The context for the work is now different. They will have to contend with “thorns and thistles” (Genesis 3:18 NRSV) growing up from what otherwise would have been fruitful ground. And, as they will discover all too quickly, not only is the earth different, but they and all their descendants have been made different by the consequence of their choice. But, their vocation and work remain the same. Despite the colossal consequences of their sin, God didn’t say, “You’re fired!” As the Apostle Paul wrote much later about the nation of Israel’s failure in their vocation as God’s chosen people, “The gifts and the calling of God are irrevocable.” (Romans 11:29 NRSV) What a remarkable demonstration of the grace and faithfulness of God. Our text today reminds us that even in the context of our greatest moral failures, we can be grateful. We can be grateful that God dignifies our choices by not coercing our obedience or annulling our moral decisions. We can also be grateful that even in our worst moments God’s calling for us remains constant. Despite our worst failures, God remains committed to us and to our work as his stewards in the world. How does God’s way of dealing with our moral choices help you deal with those you lead? How can you support those who follow you when they fail? What limits might there be as to how supportive you can be? What might it look like to hold people accountable for their actions even while remaining committed to them and their work? Lord God, we are grateful that you have made us to be your moral agents, that you intend us to freely choose to love and follow you. Thank you that you have given us the dignity of responsibility. Forgive us for the ways in which we have failed in choosing what is good, what is right, what brings life to the world that you have made. We are grateful that you do not abandon us but remain committed to the work and vocation you have given us. Help us this day to respond to you and to follow you into the work you have given us to do. We ask in Jesus’ name, Amen.